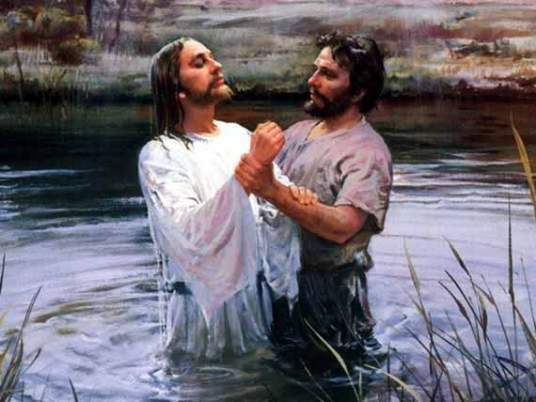 January 14, 2014 8:57 pm / 4 Comments on Why was Jesus baptized? Epiphany was January 6th. It marked the end of the Christmas season. Between Christmas day and Epiphany are the 12 days of Christmas, which most know these days through the English carol. The word “epiphany” comes from the Greek; it means “manifestation” or “appearance.” It was used primarily in religious texts to describe the appearance of a god. Essentially, Epiphany as a holy-day is the celebration that God has become a human being in Jesus of Nazareth. In the west the holiday is commonly associated with the arrival of the wise men to see the baby Jesus. In the east Christians link Epiphany to the baptism of Jesus in the Jordan by John the Immerser. You may recall the heavenly voice said as Jesus came up from the water, “This is my Son whom I love, with him I am well pleased” (Matthew 3:17). In baptism God’s Son is revealed to the world. When you read the Gospels, it is clear that John’s baptism is about repentance and the forgiveness of sins. So the question arises: Why did Jesus need to repent? Or what sin was Jesus guilty of that he needed to be forgiven? In Matthew ‘s account of Jesus’ baptism we are told that John finds Jesus’ request to be baptized puzzling for he demurs and says “I need to be cleansed by You. Why do You come to me?” (Matthew 3:13-14). But Jesus convinces John to superintend his baptism. So why was Jesus’ baptized? The rest of the New Testament and Christian tradition claim that Jesus was without sin so he had no need to repent—in the traditional sense of the word—and be forgiven. Let me suggest several reasons why Jesus went to John and insisted that the prophet dip him in the Jordan River. First, Jesus wanted to identify with John. When Jesus heard what John was doing in the desert—calling people to change their ways and announcing the arrival of the kingdom of God—the Nazarene wanted to be there, to drink it all in, for he sensed in his spirit that it may be his time. Second, Jesus wanted to identify with the women and men who were coming to John in repentance and faith. These were the “poor in spirit” Jesus would declared “blessed” in his Sermon on the Mount. Put another way, Jesus wanted to identify with sinners. Later, as controversies increase around him, he will be criticized for being a friend of sinners. Third, Jesus’ baptism marks a turning point in his life. The word translated “repentance” in most Bible translations means “a change of mind” (metanoia). Now a true change of mind is always accompanied by a corresponding change of behavior. After his baptism everything changes for Jesus. He will leave behind the carpenter shop to become an itinerant preacher and healer. He will leave behind his home in Nazareth to set up his headquarters in Capernaum. He will leave behind a private life and become a most public person. Jesus’ baptism is the turning point of his life. Fourth, Jesus’ baptism foreshadows his coming death, burial, and resurrection. Now I must admit that this last reason is more speculative, but it is certainly consistent with the story as it unfolds in the Gospel. When Jesus submits to John’s baptism, because of who he is—God’s Son, the Anointed One–he gives baptism an entirely new focus. Those who follow Jesus in baptism will do so as an act of initiation into the Christian faith; through baptism they participate in Christ’s life, death, and resurrection (Roman 6). For Christ-believers baptism is the start of their new life; it is the turning point of their lives just as it was for Jesus. There could be no better way to close out the Christmas season than with the baptism of new believers. I know many churches wait until Easter to baptize, but it makes sense for churches to follow the rhythm of the Church calendar and celebrate Jesus’ baptism and his revelation to the world by participating in the events celebrated at Epiphany.